Endocannabinoids are some of the body’s chief analgesic armaments. The lipid mediators—among them, anandamide (also called N-arachidonoylethanolamide, AEA)—are produced by neurons and released into synapses, where they act on cannabinoid receptors to dampen neurotransmission. The lives of anandamide and other endocannabinoids are brief: They are rapidly taken up into astrocytes or neurons and broken down intracellularly to terminate signaling. Prolonging the life of endocannabinoids by inhibiting their destruction has been proposed as a novel approach to pain relief. To be inactivated in cells, anandamide and its relatives must reach fatty acid amide hydrolase (FAAH), an enzyme located on intracellular membranes. How do the hydrophobic molecules make the journey? A decade of previous work offers indirect evidence that anandamide does not duck out of the synapse, shimmy across the cell membrane, and brave the watery cytosol all by itself. Instead, it appears to be selectively transported. The identity of the transporter, however, has been unclear. In a paper published online November 20 in Nature Neuroscience, a team led by Daniele Piomelli of the University of California, Irvine, and the Italian Institute of Technology, Genoa, identify a novel candidate transporter that shuttles anandamide into cells for inactivation. The transporter, which the researchers name FAAH-like anandamide transporter (FLAT), is a catalytically dead variant of FAAH-1 that localizes to the cytosol and membrane. Using a virtual screening approach, the group discovered a specific small molecule inhibitor of FLAT. In cultured cells, the compound blocks anandamide uptake. In mice, it increases serum anandamide levels and relieves inflammatory pain. The results implicate FLAT as a key protein in anandamide transport and a potential target for new analgesics. Endocannabinoid sparing as a new approach to pain treatment is exemplified by FAAH inhibitors, which raise endocannabinoid levels by preventing their metabolism (for a review, see Lichtman and Chapman, 2011). FAAH inhibitors show efficacy against pain in animal models, and one inhibitor has progressed as far as a Phase 2 clinical trial for knee pain from osteoarthritis (see ClinicalTrials.gov Identifier). Cyclooxygenase-2 (COX-2) also inactivates endocannabinoids, and researchers recently reported that familiar non-steroidal anti-inflammatory drugs increase endocannabinoid levels by inhibiting that process (see PRF related news story). Another approach to reducing endocannabinoid breakdown is to block their uptake and transport in cells. The hunt for endocannabinoid transporters so far has turned up general lipid-binding proteins including fatty acid binding proteins (Kaczocha et al., 2009), heat shock protein 70 (Hsp70), and serum albumin (Oddi et al., 2009) as candidate chaperones. As reported in the new paper, co-first author Jin Fu discovered FLAT as an alternative mRNA product of the Faah gene in brain and other tissues from rats. The variant lacked the membrane-anchoring domain of FAAH and the expressed FLAT protein showed no catalytic activity against anandamide. In vitro, FLAT bound anandamide with affinity in the micromolar range, and the interaction was inhibited by two previously known transport inhibitors, AM404 and OMDM-1. In cells, FLAT protein was found in the cytosol and loosely associated with the cell membrane. Together, these results suggested that FLAT might represent an anandamide transporter. To see whether FLAT could function as a transporter, the researchers expressed the protein in human HEK293 cells. Indeed, FLAT expression caused the cells to accumulate radioactively tagged anandamide. The transport was blocked by AM404 and other transport inhibitors. FLAT appeared surprisingly selective for anandamide: It failed to transport the endocannabinoid 2-arachidonoylglycerol (2-AG) or non-cannabinoid FAAH substrates. Cultured neurons from Faah knockout mice showed reduced anandamide uptake, supporting the idea that FLAT functions as an anandamide transporter in the nervous system. However, because experiments with the knockout mice are confounded by the fact that the animals lack both the FLAT and FAAH proteins, the researchers looked for another way to evaluate the effects of depleting FLAT independent of FAAH. Idiosyncrasies in the sequence ruled out RNA interference, Piomelli told PRF. So the group set out to find a specific pharmacological inhibitor of FLAT. To do that, co-first author Giovanni Bottegoni derived a model of FLAT based on the X-ray crystal structure of the cytosolic portion of FAAH-1 (Bracey et al., 2002). He then conducted a virtual screen of 4.3 million small molecules, computationally docking each one on the protein’s active site. The group tested the 46 top hits against the FLAT protein. One of them, ARN272, prevented anandamide binding to purified FLAT, and blocked uptake in FLAT expressing HEK293 cells or in primary neurons in culture. Importantly, ARN272 only weakly inhibited rat brain FAAH activity, and was not itself a substrate for recombinant human FAAH-1. Consistent with its ability to block anandamide uptake in vitro, ARN272 increased plasma anandamide levels in mice. That result spurred the researchers to test whether the new inhibitor could alleviate pain. Systemic or intraventricular administration of ARN272 reduced formalin-induced pain behaviors. The compound also alleviated thermal hyperalgesia and edema from carrageenan injection. The analgesic effects were mediated by cannabinoid type 1 (CB1) receptors. Top image: The endocannabinoid anandamide, a long-chain fatty acid. Nat Neurosci. 2012 Jan; 15(1):64-9. Epub 2011 Nov 20. This is an important study, which fills in many gaps in our knowledge. 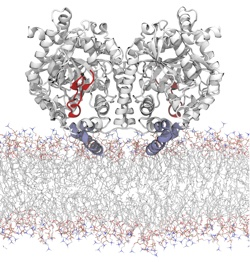 The characterisation of FLAT, together with the identification of other chaperone molecules and the report that anandamide can bind to, and translocate through synthetic cholesterol-containing lipid bilayers, provides a compelling picture of the transport of anandamide from the extracellular space to its metabolising enzymes. It would be of great interest to know how FLAT production is regulated, and whether it is dysregulated in disease processes. The paper provides evidence at the mRNA level concerning the expression of FLAT in different tissues, and this raises the question both concerning the tissue selectivity of FLAT inhibitors and how anandamide is transported in FLAT-deficient cells.